For many forms of cyanobacteria, relentless bright light slows growth or even causes damage. But under the same conditions Synechococcus sp. PCC 7002 thrives and grows at a rate that far outpaces most of its peers. That makes the organism attractive for scientists trying to create better, less expensive biofuels or trying to make custom chemicals. Results: Now researchers have figured out how Synechococcus sp. PCC 7002 does it. The organism triples in size to accommodate a rapid expansion of the cellular equipment it uses to build key proteins. In turn, these proteins help the organism flourish under intense light by converting the light into useful energy to keep growing. The findings by scientists at the U.S. Department of Energy's Pacific Northwest National Laboratory, in collaboration with scientists from several other institutions, appeared July 26 in the online journal mBio. The team included scientists from PNNL, the Colorado School of Mines, The Pennsylvania State University, Montana State University, Purdue University, and Washington State University. Why It Matters: Synechococcus sp. PCC 7002 is a model organism that is studied to gain insight into general, genome-informed biological principles. In turn, such study can be used to redesign other microbes and microbial communities for the sustainable synthesis of biofuels and other bioproducts. Cyanobacteria capture the sun's energy to make food for themselves, while at the same time drawing in carbon dioxide and giving off oxygen. These single-celled organisms, on Earth for billions of years, play a critical role in Earth's climate. Scientists are trying to take advantage of their age-old natural processes to create new forms of energy. "These organisms are the major pathway for capturing solar energy and carbon dioxide on our planet," said PNNL scientist Alexander Beliaev, one of two corresponding authors. When light comes in too fast and too intensely, most cyanobacteria slow down and experience some damage. The light energy simply overwhelms their systems. But Synechococcus sp. PCC 7002 is chemically adept at using the extra light for rapid growth. The organism typically doubles in size in less than 2 hours; other species typically double between 7 to 12 hours. To illustrate: If you start with a one-foot by one-foot plot of blue-green algae, the standard organism would cover the floor of a small office in 48 hours. But in the same time frame fast-growing Synechococcus sp. PCC 7002 would cover more than 600 football fields. 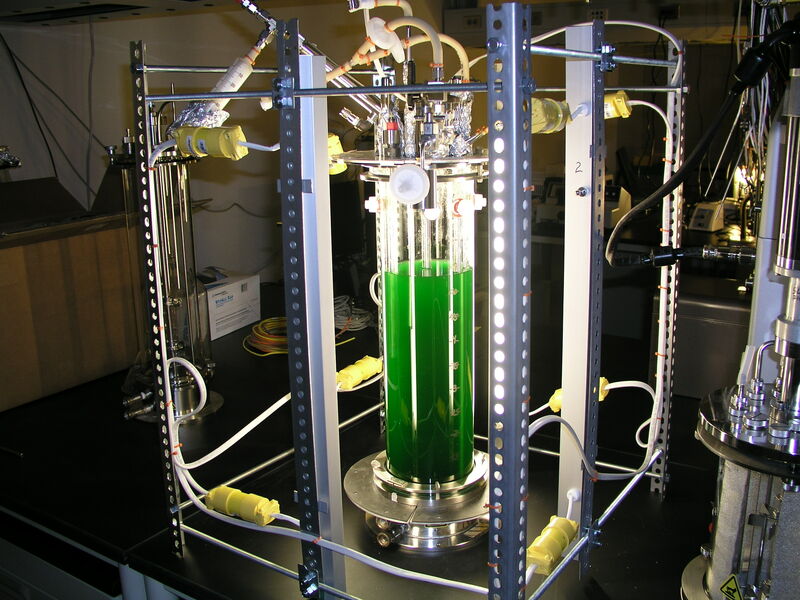 That's attractive to scientists trying to grow cyanobacteria as a source of fuel. "Everyone's question is: How can we make affordable fuels and chemicals faster? It's a critical choke point for renewable biofuel processes," said Hans Bernstein, also a corresponding author. Methods: The Bernstein and Beliaev team set out to understand the capability of Synechococcus sp. PCC 7002 for fast growth. They used the resources of the Environmental Molecular Sciences Laboratory (EMSL) to ferret out the molecular signals that allow the organism to stay productive even under bright light. Capabilities at EMSL, a Department of Energy user facility, allowed the researchers to determine which genes were active. Under bright-light conditions, other cyanobacteria normally slow down. But Synechococcus sp. PCC 7002 expanded very rapidly. The organism quickly built molecular machinery to convert light energy and carbon dioxide into new growth. The organism activates more of the genetic signals involved in building proteins in the cell. The activity of some genes increased markedly: those activated for building proteins, harvesting light, converting sunlight into food, and taking up carbon dioxide. To accommodate all the increased activity, the cells of Synechococcus sp. PCC 7002 triple in size. "This organism responds to very high light levels by fixing carbon dioxide and upregulating machinery to make biomass," said Bernstein. "It's building proteins as fast as it can for rapid growth, and that requires additional space." What's Next? Biological research is now underway at PNNL to understand how general these genome-informed biological principles are and how they underpin the productivity and stability of metabolic and spatial interactions in more complex microbial community systems. Research Team: Hans C. Bernstein of PNNL and Washington State University; Ryan S. McClure, Eric A. Hill, Lye Meng Markillie, William B. Chrisler, Margie F. Romine, Jason E. McDermott, James K. Fredrickson, and Alexander S. Beliaev of PNNL; Matthew C. Posewitz of the Colorado School of Mines; Donald A. Bryant of Pennsylvania State University and Montana State University; and Allan E. Konopka of PNNL and Purdue University. Reference: Bernstein HC, RS McClure, EA Hill, LM Markillie, WB Chrisler, MF Romine, JE McDermott, MC Posewitz, DA Bryant, AE Konopka, JK Fredrickson, AS Beliaev. 2016. "Unlocking the Constraints of Cyanobacterial Productivity: Acclimations Enabling Ultra-Fast Growth." mBio 7(4):e00949-16. July 2016. DOI: 10.1128/mBio.00949-16. A new paper investigates an ultra-robust, fast-growing, light-loving cyanobacteria whose unique properties are industrially relevant to making economically viable biofuels.